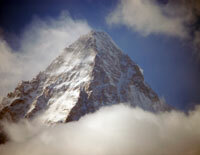 It was a record weekend on K2 with over 60 summits breaking the record of 51 set in 2004. Another record set was by Polish climber and skier Andrzej Bargiel who put together an amazing route to ski directly from the summit of K2 to base camp. But the celebrations were quieted on news that 41 year-old Japanese climber, Mr. Kojiro Watanabe died on K2. He had summited along with his five Japanese teammates. It appears he fell during the descent in the Bottleneck, a well-known challenging area. He fell around 8,300-meters about 6:00 pm local time. They had summited between noon and 1:00 pm on Sunday, July 22, 2018. This is the second death on K2 this season. Canadian Serge Dessureault fell near House Chimney while descending on July 7, 2018. Using the same formula on K2 as they do on Everest, Nepali operator Seven Summits Treks put 31 people on the summit of K2 Saturday, July 21st. They provided a support ratio of 2 Sherpas for each member and climbed on supplemental oxygen. The climbers were from Mongolia, China, Japan, Belgium, Switzerland, Mexico and Ireland. Also summiting that day were three members and two Sherpas from the commercial team Summit Climb plus two other Sherpas from Madison Mountaineering who were assisting with the route fixing. After a miserable beginning to July, the weather turned for the better the last week allowing teams to complete their acclimatization rotations and summit in overall good climbing conditions but it looks like the window is closing as we enter a new week. Among the summiteers this weekend were six women including Gangaamaa Badamgarav who became the first Mongolian to summit K2 as well as the first female from her country. Also summiting were American Lisa Thompson, Chinese Jianhong Li, Japanese Naoko Watanabe, Mexican Viridiana Chavez (first Latin woman) and Swiss climber Sophie Lavaud summited. At least five people summited K2 for a second time and Fazal Ali shimshal made his third summit. Jake Meyer, the youngest Briton to climb Mount Everest in 2005, aged 21 and the youngest Brit to climb the Seven Summits also summited. Noel Hanna and Jason Black became the second and third Irish to summit after the tragic story of my friend Get McDonald in 20o8. Of course the ski descent by Andrzej Bargiel stole the show. It was an amazing display of athleticism and courage. He connected four routes on the descent: Abruzzi Rib, the Česen the Messner variant and the Kukuczka-Piotrowski routes. He summited Sunday, 22nd July at 11:30am and reached the Base Camp at around 7:30pm local time. His brother filmed the feat with a drone but I bet we will have to wait for the movie to see it. Both days were good on K2, but not records as that was on July 26, 2014, when 33 people stood on top (source with names) By my count, there are now 432 total summits by an estimated 417 individuals. Monday, July 23, 2018 saw a few more summits including Yuki Inayoshi with Karakorum Expeditions and Sergi iIngote, no Os, who also summited Broad Peak this season. In addition to Furtenbach Adventures , there are still a few climbers left on K2 including Fredrik Sträng and David Roeske. Thgye have already left K2 BC for their summit push. They hope to get there by Tuesday, 24th July. They are climbing without Os and summited nearby Broad Peak, another 8000-meter mountain, last week.